Here are some tips for your gardening safety. The hardest tip first: Admit to yourself you can’t do everything you used to. Don’t try to do everything in one day. Work for a while and then relax for a while. Most accidents happen when we are tired and are not paying close attention. You will always wish that you had the energy you had when you were 25, but you are not 25 anymore. That’s life. Like the saying goes: Make lemonade out of those lemons. Do a safety check of your yard. It only takes one misstep to trip and fall. Have a friend or family member walk around your yard with you to check for hazards — roots, uneven ground, loose steps, rocks, etc. They will see things that you might have taken for granted. Fix the things that aren’t safe or could be a hazard. It’s not enough to notice that a root sticks up if you do nothing about it. Fix it! Wear long sleeves and sturdy pants and use gloves. As we age, our skin gets thinner and branches and stickers can cause nasty scratches that might get infected. A pair of goggles or some old sunglasses will protect your eyes from a snapping branch. Carry a cellphone with you any time you are outside the house (carry it in the house, too.) You may never need it, but if you do, it could save you some very uncomfortable waiting time in the event of a fall. Use a cane or walking stick for uneven ground. Give yourself the additional support you need when you walk in difficult areas. If you happen to fall, having a cane nearby makes it a lot easier to get up. A ski pole is useful with its pointed tip; it is also a great gardening cane, handy for picking up trash or holding down that branch that is in the way. Avoid ladders like the plague. No climbing up on chairs or old, turned-over 5-gallon cans. Very few gardens have perfectly even surfaces. Don’t let a tippy ladder tip you over. If you can’t reach something, let it be. Stay away from that slope or bank; it is a trap waiting to cause you to tumble. Compare your poorer balance and a potential broken hip against the weeds that the gardener can and should pull. Guess which one will win? If ever you should fall, however, immediately go to the doctor or call 911. Bring your gardening up to waist level. Those aching knees and arthritic joints will love it when you bring your garden closer to your reach. Arthritis is one of the most common conditions as we get older, making it harder to bend, lift and dig. So, invest in a raised planter bed or two. Not too high, maybe 2 to 3 feet. Make sure there is a nice, wide top board to make sitting and working easy. Everything in the bed should be reachable, so get one that is long and narrow, not square and deep. Need it higher? Concrete blocks or stacked bricks will do the trick. You can also create an easy container garden by adding an extra patio table. All your pots of herbs and flowers can sit on the extra table. 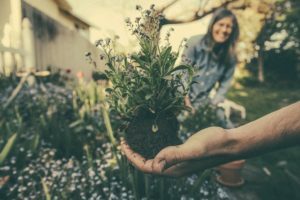 Trade your knowledge with a younger, beginning gardener or neighbor for those garden jobs that need a bit more strength. Your knowledge will help them garden better, and their help will save your back and aching joints. Everyone will benefit, and you may make some lifetime friends. Prune the fruit trees in December. Prune the roses in January. Dig and help plant a family vegetable garden in March. Put up outdoor Christmas lights and help with the tree decorating. Have them write out their gift and wrap it in a pretty box with a ribbon. Treat it as a real gift. Give them a gentle reminder when it’s time to use this valuable gift. Think about these safe gardening tips. Add in a few more of your own. Follow them and your garden will bloom, and so will you.